Has military sexual assault affected you personally? Please share if you are comfortable. 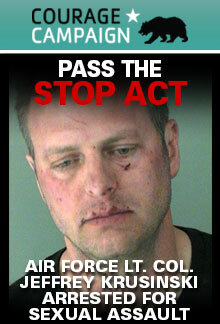 Air Force Lt. Col. Jeffrey Krusinski (pictured) was head of the Air Force's sexual assault prevention program prior to being arrested and charged with sexual battery by the Arlington, Virginia police department. Krusinski drunkenly “approached a female victim in a parking lot and grabbed her breasts and buttocks." It's become clear that the military is not capable of solving its epidemic of sexual violence. Despite years of studies and empty talk, there were 26,000 sexual assaults in 2012 -- more than 71 per day -- and up from 19,000 in 2011. The only solution that stands a chance of success is the Sexual Assault Training Oversight and Prevention (STOP) Act which will take the prosecution, reporting, oversight, investigation, and victim care of sexual assaults out of the normal military chain of command and place jurisdiction in an autonomous Sexual Assault Oversight and Response Office made up of military and civilian experts.